November Weigh-In and Workout Progress Report | Keep It Up, David! 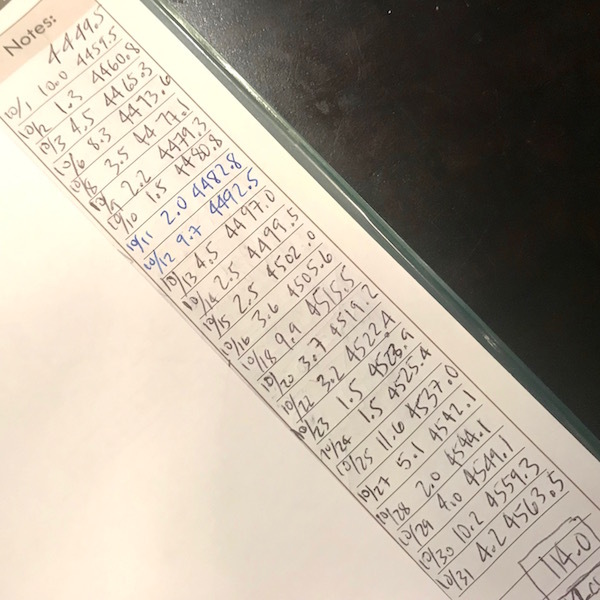 I did my weigh-in on the first of the month, as I always do, but that night I hopped on a jet plane and flew to Michigan for a wedding, and it slipped my mind when I returned four days later. Truth be told, I wanted to forget about it. 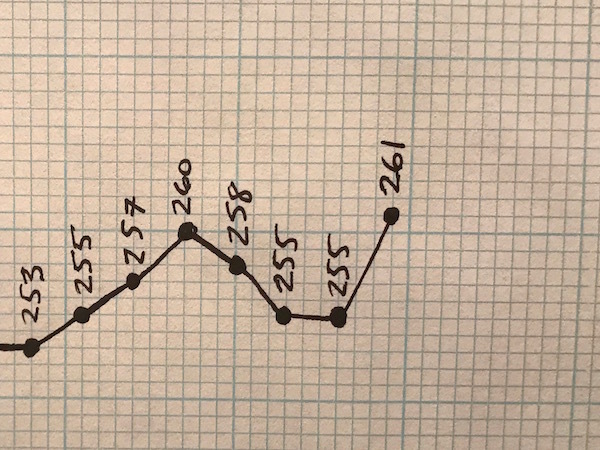 As much as I tell myself that this journey is about general health and fitness, and maintaining a smart, mindful lifestyle, and not the number on the scale, I still get bummed when the numbers are not what I want to see. Up six pounds. UGH. I knew October wasn’t my best month, but I didn’t think I had gained six pounds. And yet I had. It’s a good reminder that my health is a slippery slope, and I can’t slide just a little, because a little quickly turns into a lot. I remember hearing Richard Simmons once say, when asked why he doesn’t eat cake, even a tiny piece, that “a sliver leads to a slab leads to a slob.” It’s not an eloquent mantra, but it’s one I understand fully. I’m no slob, but I do need to do better at staying away from the slivers. Slivers add up. For anyone reading this that’s thinking it’ll be smooth sailing once you get to your goal weight… think again. This never gets easier. Hopefully you’ll gather resources and tools to make navigating it easier, but temptation always lurks, and ‘moderation’ can be subjective. And I say this not because I’m pessimistic, but because I’m realistic. There’s a reason that ninety-something percent of all pounds lost get regained. It’s hard work, and it’s ongoing, and at times it’s downright unrelenting. There are times that I feel super gung-ho about everything, and it’s clear that right now is not one of those times. But that doesn’t mean I’ve given up. I don’t ever want to give up. It just means that I need to recognize the work that I’m doing, find the weak spots, and focus on making changes to strengthen them. 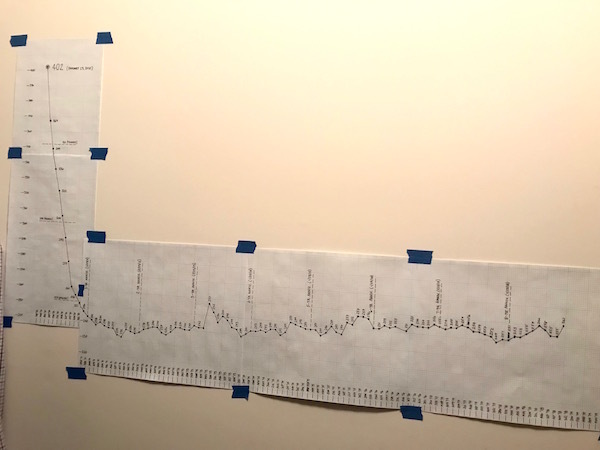 In addition to being the way I display weight gain, my weight loss chart also serves as my greatest reminder of my successes. I don’t forget that, ever. When I do start sliding, like I have been, I can see, with one glance, that I’ve come a helluva long way, and that I’m capable of doing amazing things. 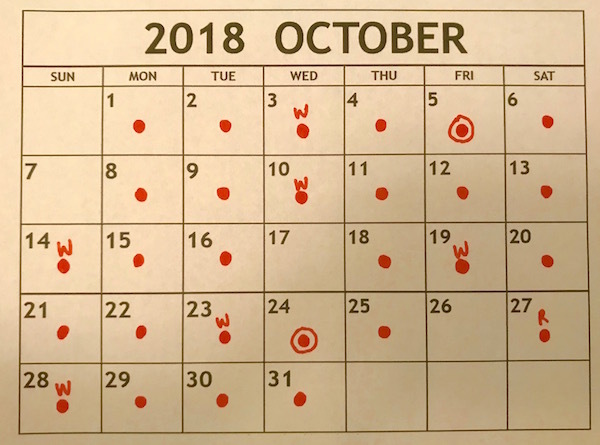 I took two aerobics classes that my friend Anne taught (the dots with circles), competed in one race (the dot with the ‘R’ on the 27th), and had 6 weightlifting workouts (the dots with the ‘W’s). All great stats! And I completed 114 Cardio Miles! I monitor the distance I cover while doing any kind of exercise, and track it all, and keep a running tally. I crossed the 4,500 mile threshold during October, and ended the month at 4,563.5 cumulative miles. THIS is what I have to keep doing. Continue focusing on the good stuff, the stuff I’m doing right, and stop dwelling on the rest of it. Dwelling does no good, and I’m not going to lose weight thinking about it over and over. I have to keep doing the good stuff, and find solutions to turn the other stuff around. This entry was posted on Tuesday, November 13th, 2018 at 7:34 pm and is filed under Uncategorized. You can follow any responses to this entry through the RSS 2.0 feed. You can leave a response, or trackback from your own site. You are so right, weight loss and a healthy lifestyle and weight is a lifelong journey and a lifetime quest! You still had a spectacular month with activity! No one knows better than your parents the ebb and flow of weight loss. We’re so very proud of all your accomplishments and know that you will find the kick start you need to get back on track. You’re just in a little rut and need to change something in your life to motivate you, Maybe a move? 🙂 !! Or different job, or volunteering?